Annually the Karene O’Hare Ovarian Cancer Memorial Run/Walk (Aka: the Hare and Tortoise New Quarter Park 8K Run/Walk) is held on the first Saturday following Labor Day. The first event was held in 2009 and the 7th annual event will be held this year on September 12. September is National Ovarian Cancer month. The fundraiser has two missions: to underwrite Ovarian Cancer screening for uninsured and underinsured women and to fund educational initiatives. These missions respond to important community needs for women of all ages. The Lackey Free Family Clinic and the Olde Towne Medical and Dental Center provide the services. To date, we’ve donated $107,000 to underwrite the screening and additionally, donated $6,000 in support of educational initiatives. Ovarian Cancer is the 10th most common cancer found in women, and the 5th leading cause of cancer-related deaths in women. About 22,000 women annually will receive a new diagnosis of the disease and about 15,000 women will die from the disease in 2015. The disease accounts for more deaths than any other cancer of the female reproductive tract. If diagnosed early, when confined to the ovaries, the 5-year survival rate is over 90%. The disease is difficult to diagnose because the symptoms associated with its diagnosis are subtle and easily confused with other conditions. Only about 15% of all cases are found at stage 1 due to the cancer’s non-specific symptoms. The majority of Ovarian Cancers are diagnosed late, after the cancer has spread. If the cancer is caught in stage 3 or higher, the survival rate can be as low as 29%. The lifetime-risk diagnosis for breast cancer is 1 in 8 women, for cervical cancer 1 in 145, and for Ovarian Cancer 1 in 58. A 5-year survival rate comparison however reveals a stark picture of the situation when viewed from this perspective. The over-all survival rate (the percent of diagnosed women still living 5 years after a diagnosis) is 89% for a breast cancer diagnosis, 72% for a cervical cancer diagnosis, and 46% for an Ovarian Cancer diagnosis. Research shows that about 90% of women with early-stage Ovarian Cancer experience symptoms. Studies have shown that the following four symptoms are more likely to occur in women with Ovarian Cancer than women in the general population: bloating, pelvic or abdominal pain, difficulty eating or feeling full quickly and urinary symptoms (urgency or frequency). Women with Ovarian Cancer report these symptoms are persistent and represent a change from normal for their bodies. The frequency and/or the number of symptoms are a key factor in the diagnosis of Ovarian Cancer. While early detection is a key, which greatly increases the chances of survival, there is no easy to administer effective “one size fits all” test for detecting early Ovarian Cancer. Methods exist to reduce the risk but nothing exists to prevent the disease and the exact causes of Ovarian Cancer are not known. Significant misinformation exists about the disease. The National Ovarian Cancer Coalition has reported that 62% of Americans surveyed erroneously believe that a Pap smear can detect Ovarian Cancer. A Pap test screens for cervical cancer but will not detect Ovarian Cancer. Our ability to continue underwriting the costs of screening for women who otherwise likely could not access these services depends upon the generous support of our donors, sponsors and entrants. We need the help of others to successfully fight this disease. You can register as an entrant, you can recruit friends to join you and participate as a team, you can make a donation to help offset our run costs, or you can become a sponsor. Everyone can play an important part in the effort to raise the needed funds to fight this disease. Please get involved. 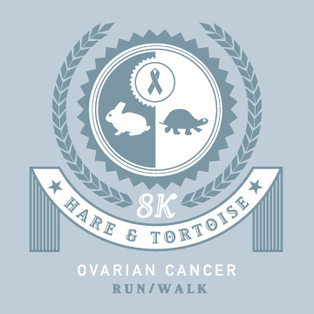 For more information on Ovarian Cancer, or on how to enter the event, make a donation or become a sponsor visit our web site at: www.hareandtortoiserunwalk.com.